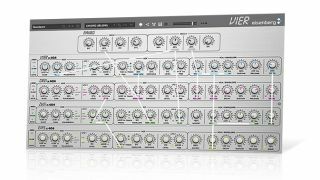 Eisenberg's new Vier synth features four emulations of the Doepfer MS-404. Tell us how and why Eisenberg was founded. What's the company philosophy? "Dennis and I are two core developers at Eisenberg, and we met at Native Instruments, where we were working for many years as DSP developers. My PhD was in Music Information Retrieval and Pattern Recognition, and when I had the idea to combine these algorithms with classic DSP algorithms, Artificial Intelligence Studio Technology (AIST) was born. Soon after this, Dennis and I broke new grounds and together with my wife Jenifer, who has a strong entrepreneurship background, and two other friends Eisenberg Audio was founded. The main philosophy is to fully explore AIST and to port all aspects and possibilities into real-time software. Another philosophy is to make things as easy as possible for the user without sacrificing sonic possibilities. The ideal of Eisenberg is the perfect flow between the musician and the instrument." Einklang is different to the control-packed synths we're used to seeing. What kind of user/audience is it intended for? "The basic idea was to allow the user to think in plain sounds and musical parameters rather than in technical controls. When we came up with Einklang, we really had no idea who the audience would be. It turns out that we've reached several different groups. We had customers who bought Einklang as their first synth. As almost everybody today has access to computers, these musicians try to dig into synthetic sounds without having to deal with the technical background. Einklang is also in use by film music composers and people mainly using sound effects. We also have traditional producers as customers who give us the feedback, that Einklang sometimes helps them to 'think around the corner' and to find new creative approaches when a production gets stuck late at night. Putting Einklang in simple words: we tried to do something completely different and to add another flavour to the whole creative process." Why can we not design our own tone colours in Einklang? "Unfortunately, by now it's a technical limitation. In the first stage of sound design, the tone colours are composed like building sample maps. The key difference is that we don't have to form rectangles in the pitch/velocity map but we can define singular points with sounds. The space between these points then gets modelled by what we call intra-morphing. The two Tone Packs - Black and White - make excessive use of this. The second step of sound design is what prohibits giving the sound-design tool to end-users. That is the training of the Artificial Intelligence engine. In this step, the engine 'learns' the nuances of the specific sound and applies a matching model to it. 60% of the time, this works perfectly well with the default settings, but in 40% of the cases, this goes wrong or terribly wrong and the system needs to be fine-tuned. This takes quite long, and users need to have some expert knowledge about Artificial Intelligence. We are working on enhancing the training rate of the Artificial Intelligence because we definitely want to hand the sound editor to the end-user some day." "Einklang will remain quite pure and simple, but we'll try to enhance the synthesis quality and reduce CPU usage." What can we expect to see for the future of Einklang? "We will go both ways. Einklang will remain quite pure and simple, but we'll try to enhance the synthesis quality and reduce CPU usage. We also plan to add some more musical parameters like transient-sharpness, and to broaden the modulation possibilities. Besides this, we plan to take the core technology of sound morphing and mix it with more traditional synthesiser elements like filters and LFOs in another product. Our next instrument, Vier, explores some of the technologies we'll mix up with the AIST"
What can you tell us about Vier? It looks very different to Einklang. "I've always been a big fan of the Doepfer MS-404, which to my ears isn't a TB-303 emulation, although the name implies this. It is a unique monophonic bass synthesiser that differs in the sound of the pure waveforms and the filter design as well as the modulation possibilities of the envelope and LFOs. The filter design of the 404 is a classic Moog transistor ladder, whereas the 303 has a diode ladder. The lower filter units of the diode ladder drain a lot more current than the transistor ladder, which spreads their low pass poles (ie, the single cutoff frequencies of each of the four filters) in the diode ladder. First, this leads to a flatter frequency response around the cutoff frequency which often got associated with an -18dB filter, although technically it's a 4 pole filter acting as a -24dB filter (in the higher range)." "Second, the filter of the 303 introduces much more distortion at high resonances. That is probably also the reason why Roland limited the resonance of the 303 to not reach self-oscillation.When I was a teenager and the 404 was big in the nineties, I always dreamt of owning four of it, as they were monophonic and I wanted to play chords. So with the Vier (which means four in German), this is the late realisation of my dream. We tried to stick as close as possible to the original sound of the 404, yet we added some possibilities like the Drive control that adds analogue distortion to signal at three core points: after the VCO, inside the filter ladder and in the VCA/Envelope section. Besides this, we've added some features to make Vier more than the sum of four units, such as the voice management and the parameter linking features: the voice management allows you to split the four notes of a chord automatically into the four units' the parameter linking feature allows you to link any parameter, giving you powerful access to many parameters at once." Beyond Einklang and Vier, what can we expect to see from Eisenberg? Is there an 'ultimate instrument' you'd like to make some day? "Einklang will grow, and we'll port more and more of the AIST offline algorithms into the real-time environment. So you can say that Einklang version X is our ultimate instrument. Besides that, we still have many other ideas in mind, to accompany the development of this long-term project."